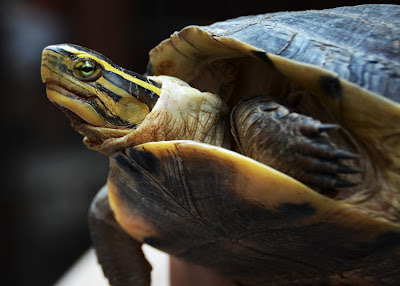 "Turtles often bite my fingertips," says Utin, splaying his hands; showing fine white sickle-shaped scars. "I chew a little ginger and celery and apply it to the wounds to quicken the healing." 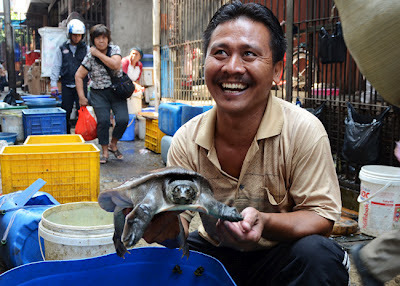 Mustachioed Utin sells terrapins, tortoises, and eels at the Glodok market in north Jakarta. The lane around him is a confusion of crates, bucket water, and blood. 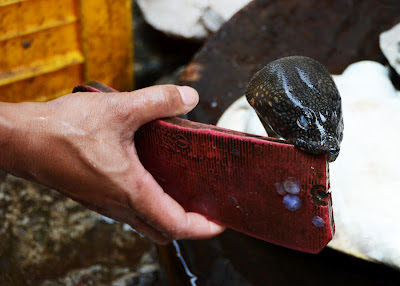 Eels snake darkly in deep tubs. Wooden chopping boards glisten red. 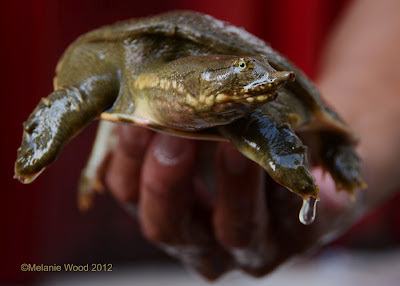 "Terrapins are tastier than tortoises," says Utin, pointing to a tub of soft-shelled, mole-snouted labi labi. They have pale lateral stripes across their mushroom-brown shells. "I love eating them! I’m not at all bored!" Wiping their rubbery, webbed feet against the plastic walls, the terrapins crane their long necks to see over the tub lip. 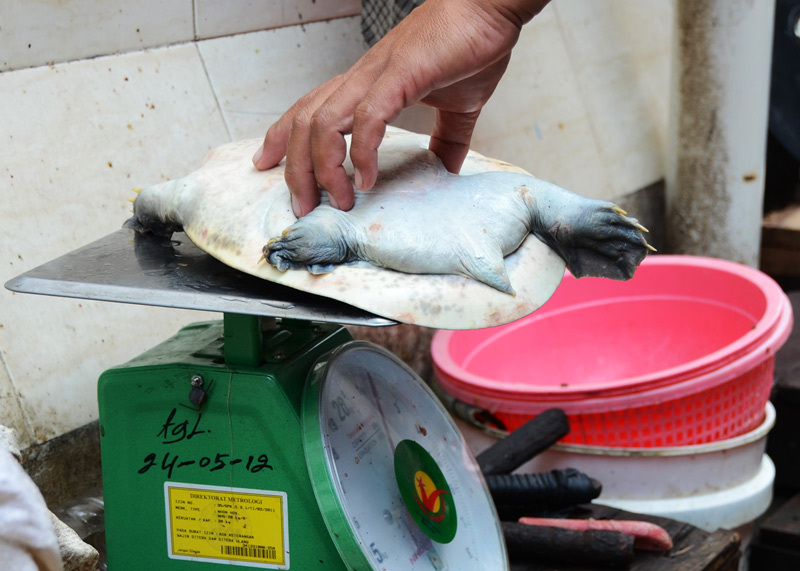 The terrapins weigh between one and two kilos each, and sell for Rp 60,000 per kilo ($6.00). 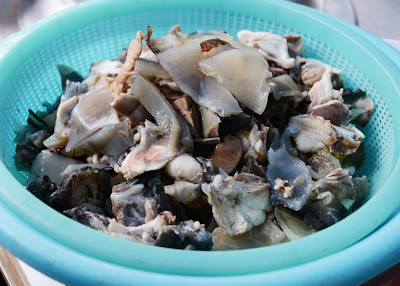 Utin sells around 50 kilogrammes of turtle a day. "This one weighs ten kilos though!" 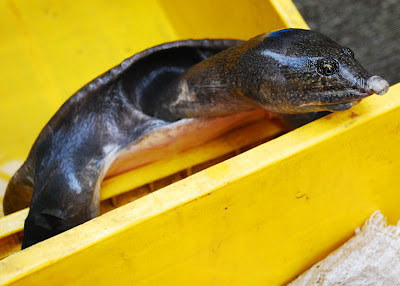 exclaims Utin, untying a sack and tipping out a grey elephant-necked turtle with clawed flippers, a narrow mottled face, and a pink-tipped snout. He balances it across one palm. Suddenly the turtle slips from grip and falls nose to road. "No problem!" Utin calls, retrieving the floundering reptile. A customer approaches. Utin talks through the butchering process. "First, grab the turtle by a back leg and dangle it upside down." The terrapin’s exposed belly is nakedly soft, a drowned white. "Then wave your hand before its eyes." This snake-charmer flutter coaxes the terrapin’s head forward. As the neck extends, the long throat is exposed. Utin strikes, grabbing the turtle at the base of the neck, holding the neck at right angles to the shell. "Then you cut its head off." "But check this out," another trader interrupts. He holds an old red sandal sole in front of the disembodied head. The muzzle snaps at the sole, clamping its jaws shut. The trader lifts the sole into the air taking the biting head with it. 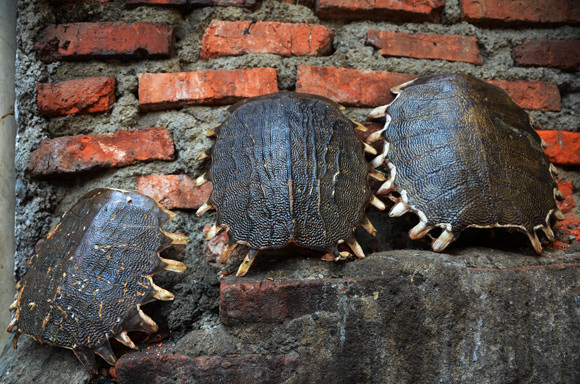 Utin slices the carapace from the turtle. Under the shell, the innards are mauve, lilac, and custard yellow with pools of claret blood. He discards the stomach and intestines, and slides the flesh and organs into a black plastic bag for the customer. Stiffening in the sun is a row of shells. They look like breastplates or microchips. Utin taps one. Tud tud. Utin’s father and grandfather were reptile sellers, but he wants the family tradition to end. "My children can do whatever they want, but not this. Something better." Across Jl. Gajah Mada is the 90-year-old Tak Kie Kopi Es coffee house. Just outside the café is a row of turtle soup chefs stirring vats of fermented bean paste broth at their wheeled wooden carts. One pioh tim tauco chef washes the turtle meat in broth three times before spooning a try-only size portion into a plastic bowl. "This is not enough," he grumbles. Indohoy's Mumun and I toy with the dish, tasting the broth and nibbling at the soft, white, chewy meat. "Don't make friends with your food before you eat it," Mumun sighs. We drink our coffee instead and the soup cools between us.